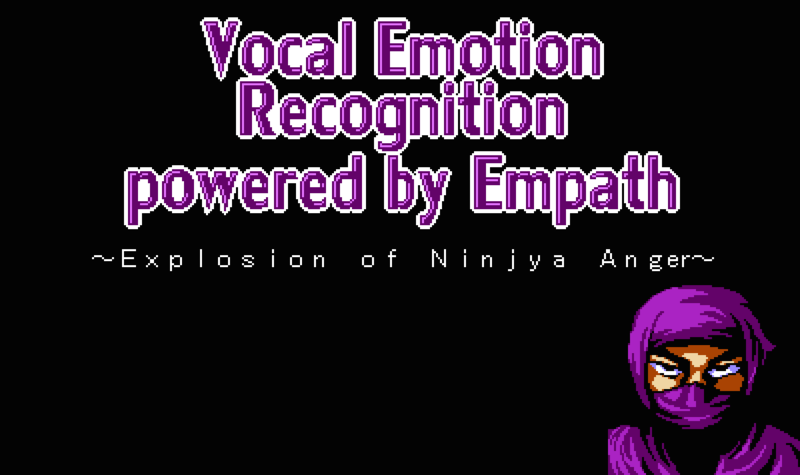 By using emotion recognition technology, this Ninja game detects your anger from your speech. 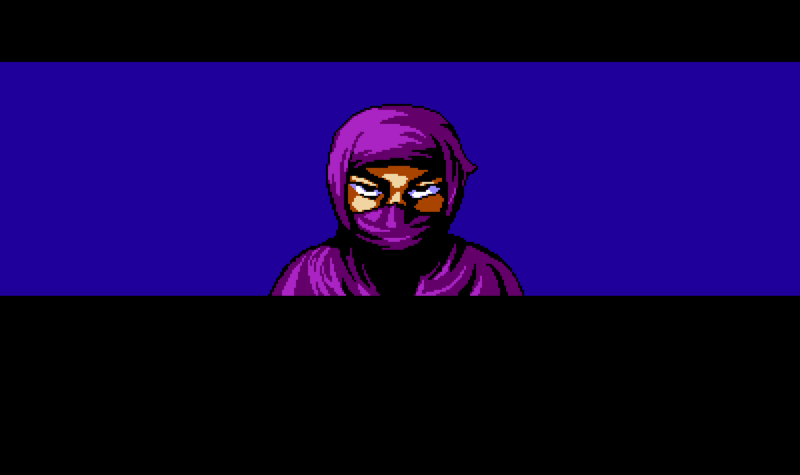 You are a ninja and fighting with an evil enemy. The enemy stole an original scroll of the Chronicles of Japan, a secret book on the ninja and ninjyutsu (the strategy and tactics of unconventional warfare, guerrilla warfare and espionage purportedly practiced by the ninja). The book consists of secret techniques of the ninja, which are taught only to the first disciple who succeeds the ninja master and never allowed to be taken out of the ninja house. Perform a special Ninja move by shouting in anger and beat the enemy! Shout out a special move after pushing a “READY” button! 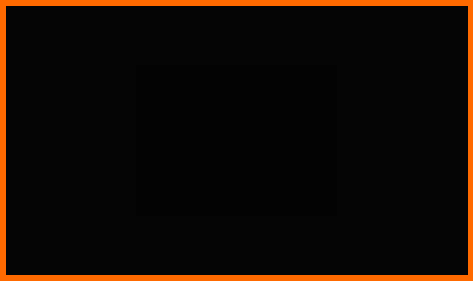 A phrase of a special move is displayed on the screen. Aona ni shio ( 青菜に塩 ) : "Greens sprinkled with salt"
You are such a wimp! Just as greens sprinkled with salt wilt, so a ninja when depressed or cowed looks wilted. According to The Chronicles of Japan, if a ninja ever fails his mission due to his timidity, people are to sprinkle salt on him and his kitchen garden without mercy. This means not only he but also generations to come will be disgraced. "Peach Boy takes three years to become full-fledged, ninja take five"
You have not undergone enough training to be a ninja yet. According to The Chronicle of Japan, it took three years for Peach Boy, a popular hero of Japanese folklore born from within an enormous peach, to defeat the Kamakura shogunate. 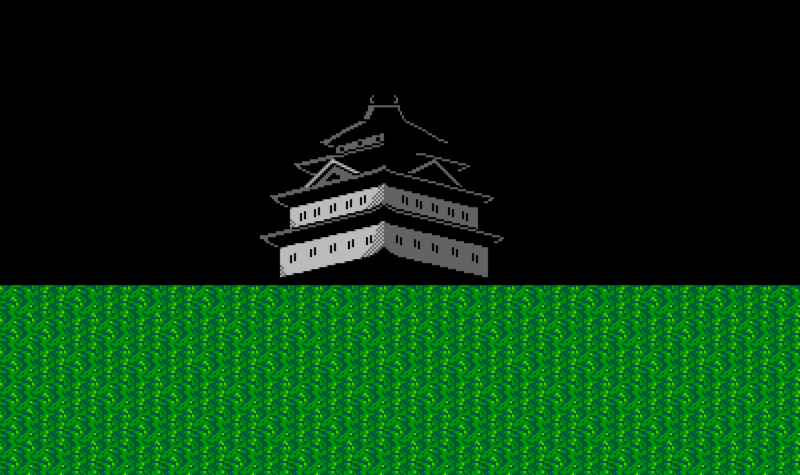 On the other hand, it took five years for ninjas to destoroy Peach Boy Regime and establish Edo shogunate, which is the first Ninja government in Japanese history. This proverb shows that perseverance brings success. Keep training yourself! Kusattemo Ninja ( 腐っても忍者 ) : "A ninja on a dunghill is still a ninja"
You are a ninja! Even though a ninja is on a dunghill, he is still a ninja like a diamond on a dounghill. According to the Chronicles of Japan, espionage is the chief role of the ninja. Hidding themselves in a dunghill, they made an intelligence netework to monitor feudal lords, though they smelled so bad and their wives kept them away from fome. Instead of quarreling with their wives, they pointed their anger at enemies and established Ninja Regime in the Edo period. Your anger is REAL! Take calcium! Ninja ga hotoke ( 忍者が仏 ) : "Ninja is Buddha"
Awesome! Your explosion of rage is gigantic enough to blow up the world! According to the Chronicles of Japan, the eight-headed dragon almost destroyed entire Japan during the Age of the Final Dharma. As a lot of comrades were killed by the dragon, a legend ninja Nobunaga Oda converted to BUddhism and mastered a secred special move Ultra Harakiri Fujiyama Fireball. It is said that when Nobunaga finally killed the dragon, his head was surrounded by a halo like Budda. One of the withnesses shouted, He is Buddha Ninja is Buddha! Empath identifies your emotion by analyzing not what you say but physical properties of your voice such as pitch, tone, speed, and power. We can identify your emotion whatever language you speak. Empath is an emotion recognition program developed by Smartmedical Corp. Our original algorithm identifies your emotion by analyzing physical properties of your voice. 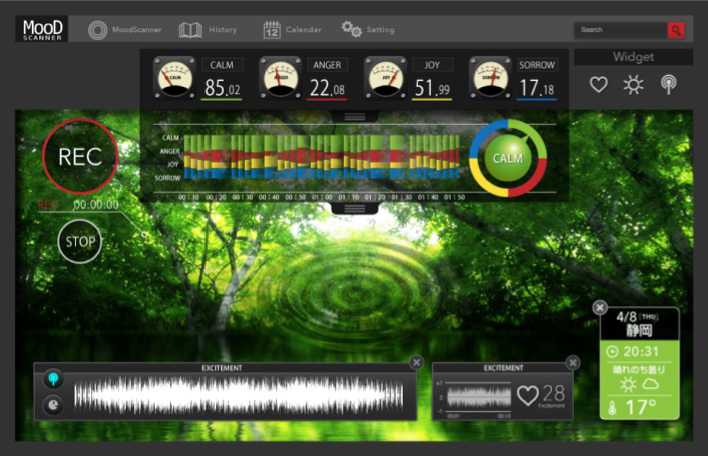 Based on tens of thousands voice samples, empath detects your anger, joy, sadness, calmness, and vigor. We provide Empath Web API for developers. By just adding sample codes to your website, you can integrate your apps with vocal emotion recognition technology.  If you have a program that sends WAVE files to the API, you can integrate the API to various platforms such as Windows, iOS, and Android OS. It’s also very easy to use the API as M2M and IoT sensor. 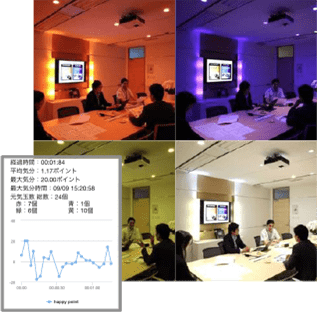 Jibun Yohou (「じぶん予報」: My Mood Forecast) is an EAP app connected with empath which can identify employees’ mood from their voices. By analyzing correlation between weather information and moods, the app forecasts diurnal and week-to-week variation of employees’ mood. You can check not only individual but also your division’s or team mood from an admin page. The app is helpful for improving your employees’ motivation. Emotion Recognition in a high – noise environment. 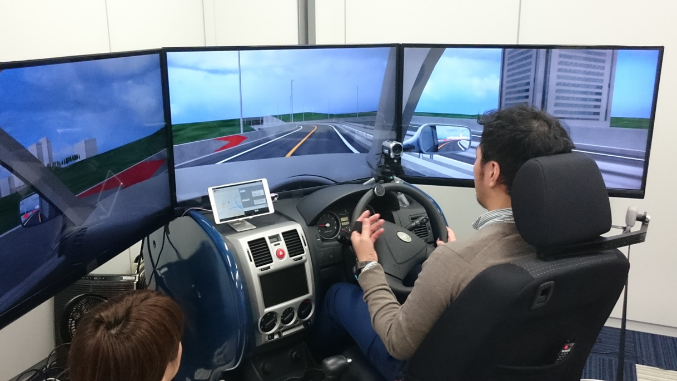 Empath Inc. has started to work with NTT docomo to encourage people to have a safe and fun drive. In this use case, we developed the system which could detect the human emotions even in a high-noise environment while people are driving. Empath Inc. was used for “Robot AI Platform” by Fujitsu. This platform makes devices; especially robots understand and communicate with human in a natural way. For example, natural communication, face recognition, emotion recognition, and facial recognition are included in this platform. 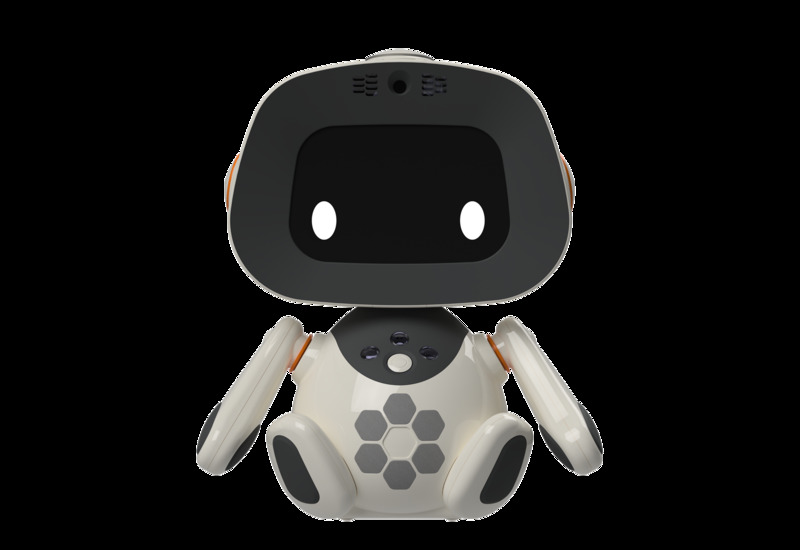 Our Emotion AI “Empath” is applied to the robot called “unibo” so that he/ she could understand human emotions. 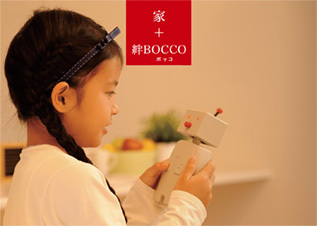 Smartmedical links Empath with Bocco, a Yukai Inc.’s easy-to-use messaging robot aimed at children. The robot can identify children’s emotion from their speech, not only sending children’s voice messages but also their emotion data to parents’ smartphones. If children are depressed, parents can notice something unusual happens to them such as bullying at school. Linking Oculus Rift VR headset with empath, we have created virtual interview system. 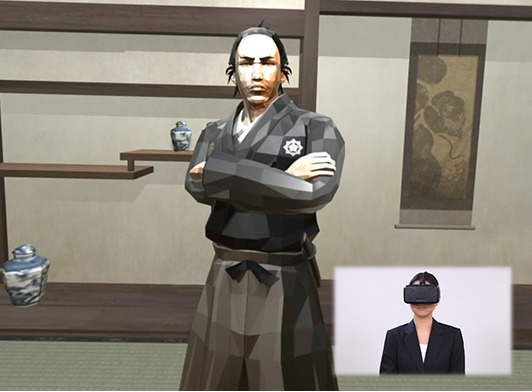 In virtual reality, you can have an interview with Ryoma Sakamoto, a prominent samurai who is very popular in Japan. Ryoma judges your vocational aptitude based on your emotion from speech. 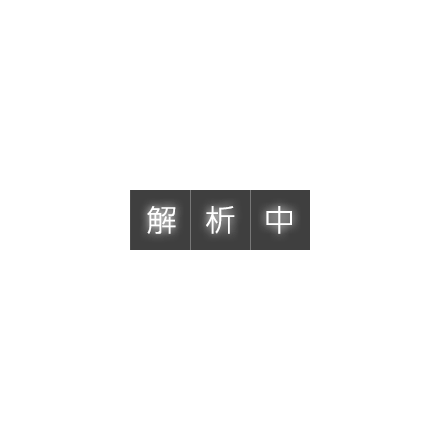 Utakata Mood-Light® is the world’s first emotive lighting app. By using Philips hue’s API, this app changes colors of lighting responding to your mood during conversation. When you are high, it changes into warm colors. When you are down, it turns into cold colors. It’s a whole new communication experience! 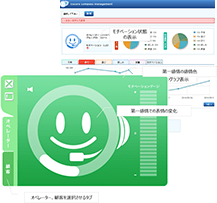 TMJ’s (Tele Marketing Japan) call center service has adopted our product Smart Call Center. With this system, call centers can visualize customers’ and agents’ real-time moods and provide feedbacks to agents and supervisors. It improves the success of outbound calls and reduces employee turnover.